What if she did not know the guy died? It was my neighbour that told me this morning about the Kolade guy! @Uberhaute, Toke is on twitter and instagram, say another thing abeg. 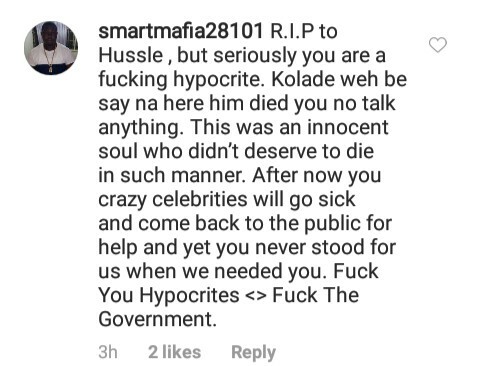 Nigerians won't rest until they control everything about you even to those you choose to mourn. But,whats with the solidarity for international causes, events etc and neglecting yours? Sometimes, we overdo it. Nse Ikpe did hers with the New Zealand shooting against the Lagos collapsed building. Now this. Ikwakwakwakwa, she knew it will cause this. She wan trend. Its her choice though...but charity begins at home. Nigerians,we have zero chill walahi! Well it's part of the fake life ryt? Nigerians have zero chill. Na wa! You people should please leave my baby girl for life. I'm mourning nipsey. I don't know him but I loved his music and his death pained me. Let people mourn who they want. Simple! why una dey chop bitterleaf soup on top matter Toke matter? una know weda Nipsy don nack and dash am cloth in one of those her abroad waka??? abeg make una free Toki baby jare. A black man died. A human being. And from what she typed, you can tell she has a message that isn't about his death and circumstances surrounding it. 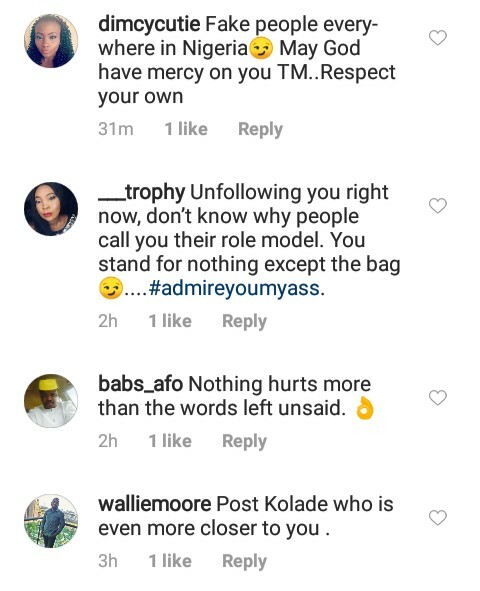 Just maybe she was going to post about Kolade’s grumesome murder. If I am not wrong, Nipsey’s death broke first. The persons calling her out, Have they even posted this Chap’s death on their own pages? Or are their pages sacred? The problem is that the world is wicked, lets tackle that! People are dyingggg. Objective about what exactly? 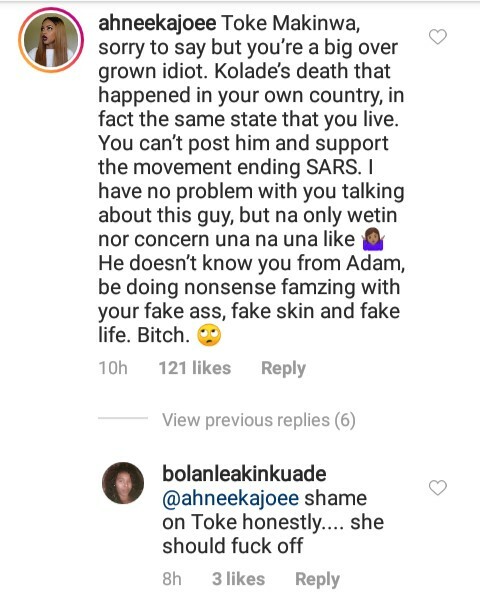 Toke is fake and that's a fact. The “End SARS” campaign didn’t start today! People should leave her alone. Hussle was a big star and a Grammy nominee. If anything tragic should happen to one of our biggest celebrities God forbid, I’m certain even foreign celebrities would be posting about it..
Social media is a crazy place. I will never forget how Kelly Rowland made a public message to Demi Lovato about her going to rehab and her own former band mate, Michelle Williams, was dealing with her own mental health issues and going to rehab and no message was given to her. Folks want to be a part of whatever the bigger cause on social media is constantly. How many Nigerian celebs even made a post for the cyclone Idai victims and survivors on their handles, a massive disaster on their own continent and not a peep. And they wonder why Africa can't be better, how can it be when they are constantly looking at Europe, ME and North America instead of looking at their own continent. yea but they neither made a post about American celebrity. We like to famz with the abroad but forget your own root. No one is talking about Cyclone Idai that hit Mozambiques! Why? If it was hurricane Katina that hit the US, all of them will come out from every nook, posting it, meanwhile countries at your backyard are being hit with worse things.. I don't know Kolade, nobody can force me to post about him.. Let people do what they like with their space. I never like Toke but leave her and let her do whatever pleases her. Don't think you can control how people think or do things.